The answers to FAQs can be found here, but we thought we’d answer the most frequently asked questions of all. Because name a better day club. From a giant, glow-in-the-dark jellyfish hovering over the venue, with aerialists hanging off the the silk ‘tentacles’, to our friendly staff ready to help with your every request, you can always expect the unexpected here. We make it our mission to ensure you have the most lavish experience under the Mediterranean sun. 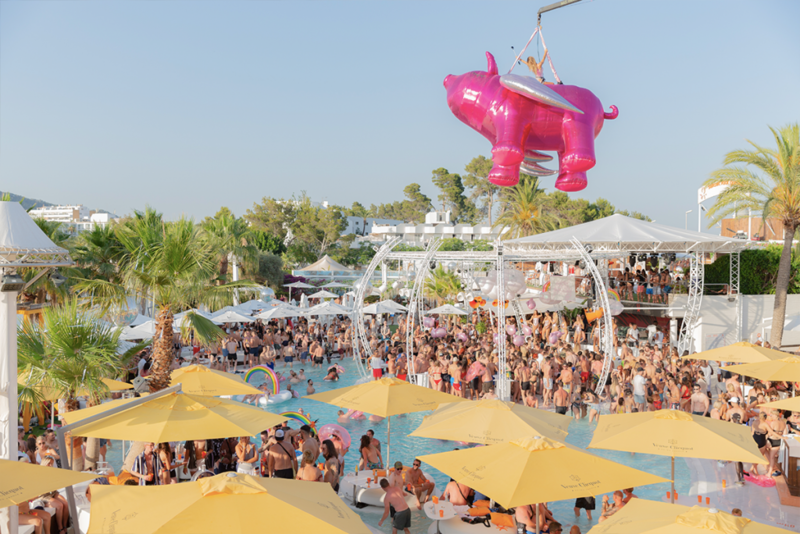 Rest assured that any and every party at O Beach Ibiza is going to leave you with memories that never fade. Good question. We really do recommend attending all of our parties as each one has its own theme, vibe and spectacular entertainment. If you simply cannot make them all then let us help you figure out the best events for you. Like the idea of nostalgic house music reimagined and brought to life with a saxophonist, pianist, violinist and guitarist? Then our HedKandi party is the one for you. Two live performances keep you clapping, cheering and dancing all day long. Mondays never looked so good. Looking to dance and sing along to your favourite r’n’b tunes and old skool anthems in the sunshine? 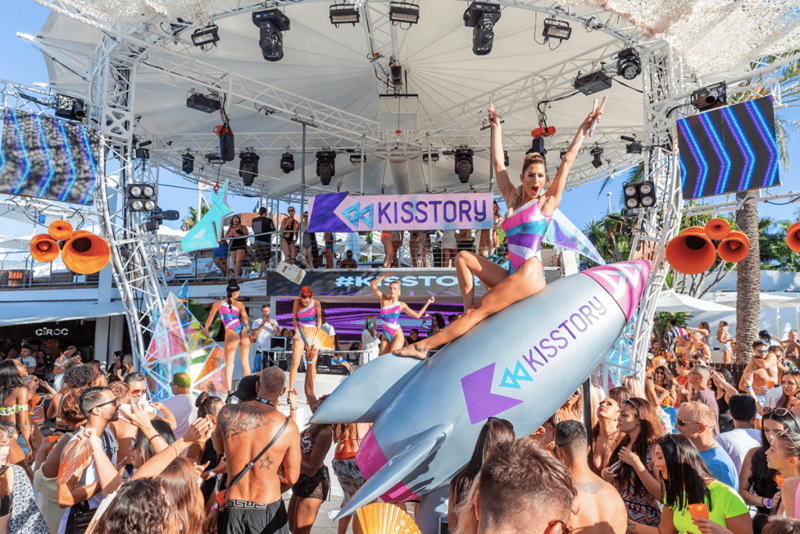 Choose Kisstory! Alongside the classics, there’ll be surprises to look out for, both in the sky, the pool and beyond. If you like the idea of wearing a tropical shirt, a floral motif or something fruity then don’t miss a HotBed Wednesday where feel-good, vocal house music and a live percussionist will keep you in a good mood from noon till dusk. Want to join us on ONE journey through the beats of r’n’b, hip hop, garage and soulful house? Come see us on a Thursday, where ONE resident DJ Spoony plus others and special guests will spin the best of the above. Look out for bboy flips and unreal shows that help you celebrate music. 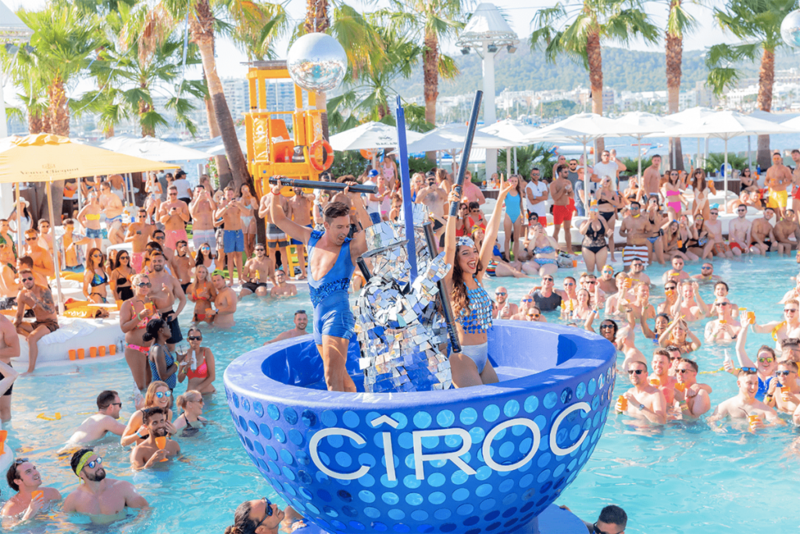 Friday pool parties are known the world over for the tongue-in-cheek production and interactive shows. Our host Ruby Murry, along with a whole lot of outfit changes from our dancers, will transport you to another world with a backdrop of your favourite house tunes. If disco music is your jam, join us at Soulheaven Saturdays. Groove to the likes of Jamiroquai and Purple Disco Machine remixes, and await glitz and glamour at every turn. The short answer is: party on. There’s around 300 days of sunshine in Ibiza and it’s fabulous. But our beautiful island does need rain from time to time and it can sometimes happens right in the middle of your vacay. We believe the show must go on, and carry on making moves with music, cocktails and extremely well-dressed dancers which is why we don’t offer refunds. If it does rain in the summer, we often find it stops by the early afternoon. On the rare occasion it doesn’t, we unfortunately have to stop crane shows for health and safety reasons but just because the entertainment in the sky stops, doesn’t mean the fun on the ground in the venue does! 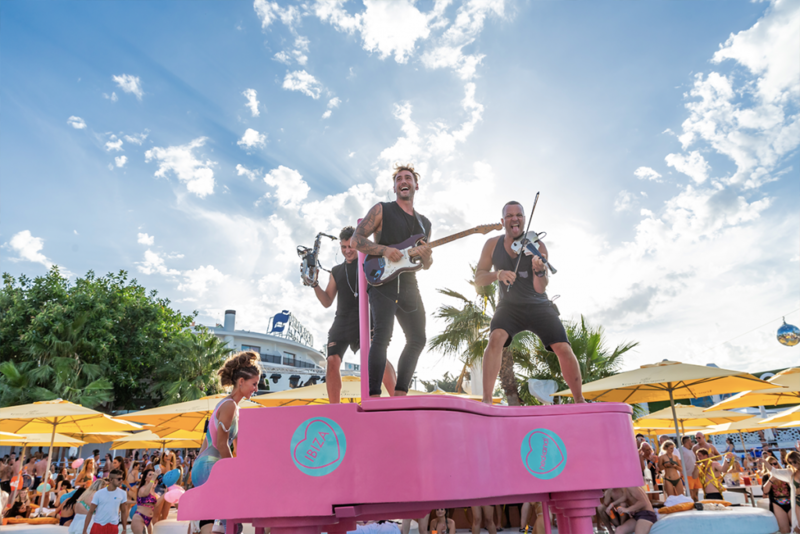 Carry on drinking and dancing because you’ll find it’s therapeutic in the rain, and hey, you’re getting soaked either way at O Beach Ibiza because if the rain doesn’t get you, then a little champagne spray or our sprinklers probably will! Whatever you feel most comfortable in! We don’t permit fancy dress but you can always live vicariously through the characters and dancer costumes you’ll see throughout the venue. We allow minimal glitter but if you’d truly like to sparkle then be sure to visit our friends at Kiss My Fairy (there’s a shop in San Antonio and a KMF stand in the venue most days). For girls in need of style inspiration, hit up ISAWITFIRST. Guys? Besides coloured shorts what else could you need? We officially open our doors at 12pm. With waiting lists as long as a piece of string, we reserve the right to resell tables, beds and sun loungers if they’re not attended to by a certain time so you’ll see sun loungers filling up by 2pm, and beds by around 3pm. Of course if you have any questions we haven’t thought of, be sure to tweet us!